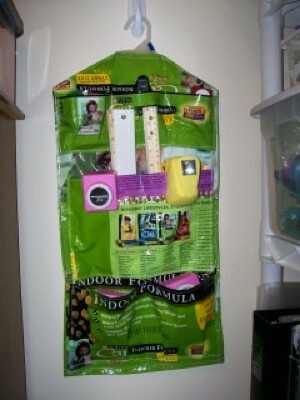 This is a guide about making an organizer from pet food bags. 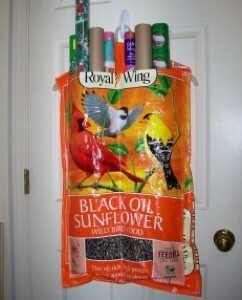 You can make organizers for storing a wide variety of supplies from empty pet food bags. 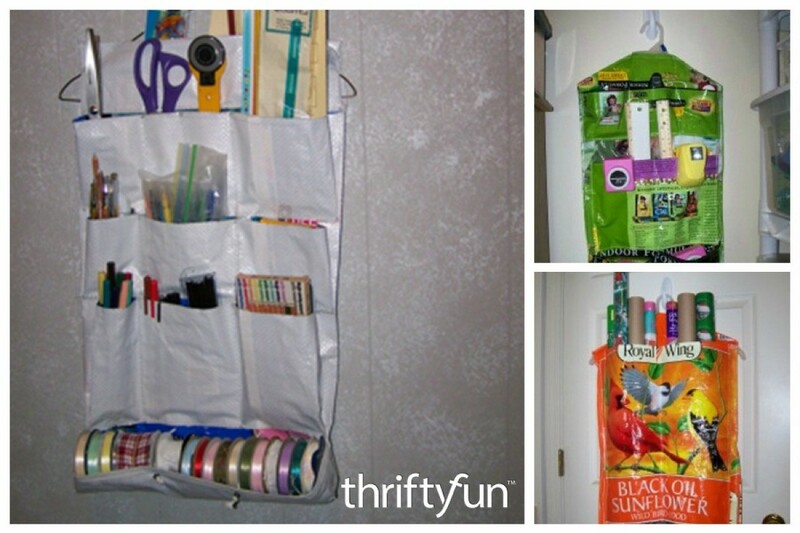 A while back a fellow TF reader mentioned making a organizer from a catfood bag. That got me going and here is the one I made. I turned mine wrong side out, measured up from the bottom the length I wanted my pockets, sewed a zigzag stitch across the bag on my sewing machine. Cut the front layer only. Be sure to cut through the folds in the sides, but not through the back. Your larger items will fit in the side compartments and by sliding the folded pleat on the sides toward the center you can give your next compartment more room. Next I turned my catfood bag and sewed lengthwise up to the cut. Then turn it back and sew across just above the cut. Repeat for each row. Slip a hanger in the top and sew it in. You could reinforce your horizontal seams with seam binding if you are putting heavy items in it. 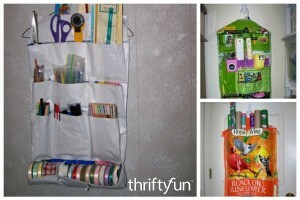 Today I used the duraweave bag from the Purina Cat Chow to make a recycled organizer. I love reusing things! I also had to hand sew a small piece with a large plastic canvas needle, as my sewing machine did not like sewing through so many layers and threw a hissy! 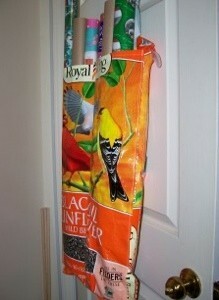 I used the plastic placemats in the back of the bag to insert into large pockets I had made. This was to add some stability to the bag, and so it wouldn't bow inward from the weight of the punches. I did make a few of my pockets on the small side, so I had to just slip a couple of my punches over the edge of the pocket, but it worked. So I am happy. I made another project from some recycled bags. These came from empty bird seed bags that a friend gave me. They are colorful and the pretty birds made them nice and bright. In fact, I had so much paper, that I had to make two. Helped free up some space in my closet. On the one side, I put lots of spots for rolled paper, and on the other side, I put exclusively pockets for gift bags and boxes. I did not have to worry about putting any cardboard or supporting materials in the inside or the pockets, as the weight of the boxes and paper kept it very supported. So the only materials I needed were two bags for each project, some thread and a hanger for each. 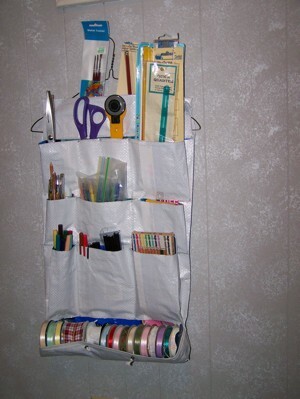 I plan for my next projects to be a much longer organizer for a door and more bags.